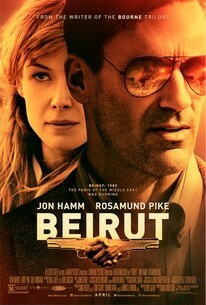 'BEIRUT' is a political thriller that reminds us of the old John Le Carre-Cold War Berlin spy novels also made into film like "The Spy Who Came in from the Cold" and "Tinker Tailor Soldier Spy". Set in the capital of Lebanon, it starts in 1972 with a well meaning American diplomat, Mason Skiles (Jon Hamm of "Mad Men"), hosting a party with various political types that include both Israelis and Palestinians. He and his wife, Nadia (Leila Bekhti) are planning to adopt a 13-year old local orphan, Karim, who's helping in serving the guests in the party. Soon, American agents pop up asking Mason to give them Karim because he has an older brother who is a terrorist in the Munich Olympics, Abu Raial. Of course, Mason resists the idea, then shots erupt when gunmen intrude and his wife dies in the crossfire while Karim is taken away by his brother. Cut to ten years later. Mason is now a labor dispute mediator in America with a drinking problem, obviously living a meaningless life and wasting his diplomatic skills on union and corporate problems. Someone then approaches him in a bar and offers money for him to return to Beirut. He's supposed to deliver a lecture in a university, but his secret mission is to be the negotiator in the release of his friend Cal (Mark Pellegrino) who's been kidnapped by terrorists. The kidnapper is actually Karim, now all grown up (Idir Chender). He requested for Mason to deal with the release of his brother who's been arrested by the Israelis. In return, Cal will gain his freedom. Mason is assisted by undercover CIA agent Sandy Crowder (Rosamund Pike, "Gone Girl"), and he has to deal with state department officials Gaines (Dean Norris), Ruzak (Shea Whigham) and Shalen (Larry Pine), who may or may not be shady. 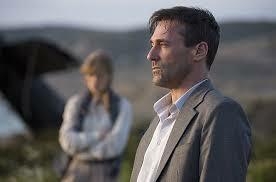 The smart screenplay about Middle East intrigues is written by Tony Gilroy, who wrote many of the Jason Bourne flicks. It requires focus and attention as it's packed with many heated discussions and explanatory scenes where many realizations are made, including which quarters can be trusted and which snaky ones have their own selfish motivations. The direction is by Brad Anderson ("The Call"), who knows how to establish tension, execute a chase scene and a final shootout quite well. We last saw Hamm as the villain who Ansel Elgort finds hard to kill in "Baby Driver". He now plays a lead role and he's certainly credible as the lead character who knows how to stay a step ahead of his both his enemies and his alleged allies who are engaged in double crosses and cover ups. He explains the predicament of Lebanon well. He says it's like a boarding house with Arabs, French, Syrians, Christians and tribes with "2,000 years of revenge, blood feuds and vendettas". After Israel declared its independence, Palestinians want to be let in but they were eased out and that starts the big conflict. Mason certainly knows how to navigate his way. He eventually overcomes his love for alcohol and being rusty to accomplish much more than what his mission originally required. The film doesn't require too much physicality the way the Bourne movies does, but we do have a hero we can root for, engaged in a perilous situation that sustains our interest. He's ably supported by a fine ensemble cast of various nationalities who give depth and credibility to their characters, headed by Rosamund Pike who's also in "7 Days in Entebbe" that's being shown simultaneously with "Beirut" here in Manila. It's a pity that both films, though worth watching, were barely promoted by their local distributors so the theaters were nearly empty when we saw them.